Spring has come on with a vengence, and we’ve had several days that are so beautiful you can’t help but be optimistic. This week we’ve got more on e-books, great resources for self-publishers, and some help for writers to get unstuck. Enjoy! 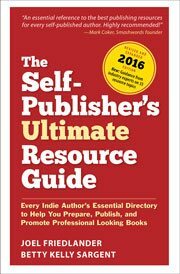 What Does It Take To Succeed in Self-Publishing? Lots of requests from reviewers this week for review copies, always a happy event for a publisher. It’s hard enough to stand out from the crowd of books, so people willing to review your book are really valuable. Marketing your books never really ends, because the opportunities to take your message to new readers keep appearing. Thanks for this roundup, Joel. My book marketing efforts have been on the back burner all month due to a heavy workload at the day job. No doubt I’ll find some great pointers in this list to help me tackle the rest of May with a fresh set of eyes! I finally bought an iPad and it arrived Friday, after downloading my own three books from Amazon (yes, narcissistic) the fourth book was your Self Publisher’s Companion, scrolled through the first twenty pages and loved it. I am on vacation next week and it and the latest steampunk book, by Hunt, are on the agenda. Along with Connelly and god knows how many others I downloaded. Thanks Joel. Greg, congratulations! You may end up loving that iPad, I know I use mine often throughout the day. Hope you enjoy the book, have fun.